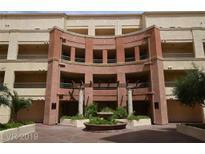 Below you can view all the condos for sale in the Meridian At Hughes Center subdivision located in Las Vegas Nevada. Listings in Meridian At Hughes Center are updated daily from data we receive from the Las Vegas multiple listing service. To learn more about any of these condos or to receive custom notifications when a new property is listed for sale in Meridian At Hughes Center, give us a call at 702-323-5939. The property comes Fully Furnished and most personal property stays. MLS#2089619. Simply Vegas. 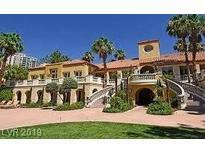 Awesome guard gated community with gym, tennis courts, racquetball, underground parking. Convenient to LV Strip. MLS#2088187. Resolution Realty. SUPER VALUE at $246/sqft*Luxury Meridian 2BR Condo located inside 16 acre Resort Style community with Lush Landscaped Grounds, Resort Style w/ Yr Round Heated Pool, SPA, Gym, Sauna, Racquet Ball, Tennis Courts, Pool Cabanas*Guard Gated*Woodflrs+Travertine-NO CARPET*Granite Counter Tops* Master BR w/ Walk In Closet*2nd BR w/ Wall2Wall Mirror Closet Doors*SS Appliances*Bright&Open FlrPlan*1-1/2 blocks away to the heart of the Las Vegas Strip* MLS#2087984. Pacific International Realty. Great for Corporate Housing or to make your Home. A MUST SEE!! ! MLS#2077894. Simply Vegas. Condo features Stainless Steel Appliances, Washer/Dryer inside condo, Stone & Carpet flooring, Covered Patio with view of LV Strip. Turn Key - MUST SEE! MLS#2084414. IMS Realty LLC. Condo features Vaulted Ceiling, Gas Fire Place, Stainless Steel Appliances, Washer/Dryer inside condo, Stone & Wood flooring. Turn Key - MUST SEE! MLS#2082219. IMS Realty LLC. Convenient to LV Strip. Guard Gated MLS#2082998. Realty ONE Group, Inc.
Steel Appl., W/D inside condo, Walk-In Closet, Stone/Carpet flooring, Window Coverings throughout, Crown Molding, Granite Counter Tops, Cov. Patio w/Storage. Sold AS-IS. Turn-Key! MLS#2083258. IMS Realty LLC. Call Us Today This One Will Not Last Long!! ! MLS#2082718. LIFE Realty. NEW PAINT, highly upgraded, marble floors, corwn molding, breakfast bar, stainless steel appliances, guard gated, 2 pools, spas, tennis, fitness center, secured undergorund parking, walking distance to the strip MLS#2081671. ERA Brokers Consolidated. Community INCLUDES 2 pools, cabanas, spa, BBQ area, tennis courts, gym, & basketball/racquetball courts! MLS#2074891. Wardley Real Estate. Featuring Stainless Steel Appliances, W/D inside condo, Wood & Stone flooring, Window Coverings throughout, Crown Molding, Granite Counter Tops, Covered Patio. MLS#2074172. IMS Realty LLC. Luxury community with pool, spa, gym, tennis court, racquetball, underground parking, guard gated and located a few blocks from the strip. MLS#2071820. Titan Real Estate & Investment. The community has 2 pools, Spa, Gym, tennis courts, clubhouse, and much more. MLS#2066800. Seven Hills Real Estate. You can see the LINQ, & Several Beautiful Hotels on the Strip MLS#2064488. Vegas One Realty. In close proximity to great dining and shopping! MLS#2056263. Silver State Realty & Inves.